Home » Even motoneurons need a break! Motoneurons are the final common pathway for every movement and muscle contraction. Located in the spinal cord, these neurons constantly receive and integrate thousands of tiny electrical signals from various parts of the central and peripheral nervous system. The end result: an action potential that travels down their axon and causes muscle fibres to contract. The motoneuron and its muscle fibres constitute the ‘motor unit’. Rather like a muscle depleted of glycogen after intense exercise, motoneurons can also get tired (Gandevia 2001; McNeil et al 2011). Even small motoneurons active during very light contractions experience fatigue (Johnson et al 2004). And just like the person who sprints to catch the bus, motoneurons can take several seconds or minutes to catch their breath and recover. In a recent study, we recorded motor unit activity (see figure) during and after light, sustained (3-6 min) muscle contractions to investigate the time it takes for human motoneurons to recover. By adjusting the strength of their contractions, study participants were able to maintain a stable discharge rate of a target motor unit. Specifically, subjects had to gradually increase the strength of these contractions in order to maintain the discharge rate. 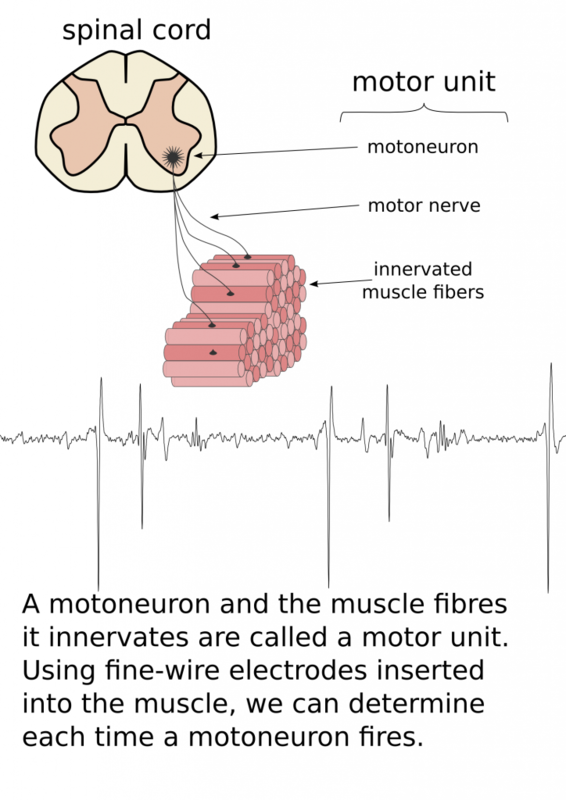 This was accompanied by an increase in the amount of global muscle activity recorded from electrodes positioned on the surface of the skin, which indicates that an ever increasing amount of neural drive was required to compensate for the declining motoneuron excitability. 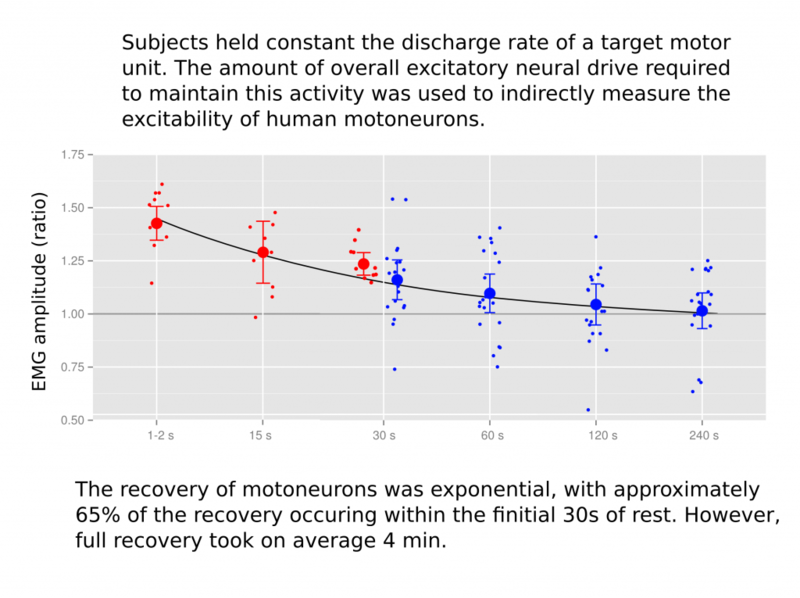 By asking subjects to resume their light contractions after rest periods that ranged from 1-2 s to 4 min, we were able to determine the time-course of each motoneurons’ recovery. As can be seen in the figure below, it took on average 4 minutes for motoneuron excitability to be fully recovered. Despite the minimal muscle fatigue associated with weak contractions such as those performed in this study (less than 10% of maximum), there is a gradual decline and slow recovery of motoneuron excitability. This is likely an ongoing process in all active motoneurons. However, we don’t perceive this ongoing process during everyday tasks because other motor units are temporarily recruited to give others time to recover. It is not yet known whether the recovery time of motoneurons is affected by various disease states. If so, this might explain the exaggerated levels of fatigue experienced by patients with a range of motor and other disorders. Héroux ME, Butler AA, Gandevia SC, Taylor JL, Butler JE (2015). Time-course of human motoneuron recovery after sustained low-level voluntary activity. J Neurophysiol doi: 10.1152/jn.00950.2015. Gandevia SC (2001). Spinal and supraspinal factors in human muscle fatigue. Physiol Rev 81: 1725-1789. Johnson KVB, Edwards SC, Van Tongeren C, Bawa P (2004). Properties of human motor units after prolonged activity at a constant firing rate. Exp Brain Res 154: 479-487. McNeil CJ, Giesebrecht S, Gandevia SC, Taylor JL (2011). Behaviour of the motoneurone pool in a fatiguing submaximal contraction. J Physiol 589: 3533-3544. Is there any way of determining whether there is an adaptive response at a motor neurone (population) level to longer term training eg sampling a population before and after a strengthening regimen. How stable a parameter is the fatigue index and what are your thoughts on fatigue resistance Vs speed of recovery? Thank you for your interest in the blog post and our research. You ask a good question. The obvious difficulty in evaluating training adaptation using the technique we used in this study is that it is virtually impossible to measure the same motoneuron on different testing days. However, if training had an effect on the majority of the motoneuron pool -which is highly likely- then it may be possible to see before-after difference in the rate of motoneuron recovery. This would definitely be something work considering for the future. I am not as clear about what you mean by fatigue index; is this a term from the literature or are you referring to how we measured motoneuron excitability in our study? In terms of fatigue resistance and speed of recovery, our results suggest that for a single motoneuron, there is probably no such thing as fatigue resistance if activated at a sufficiently high level. However, a muscle and its associated motoneuron pool can, in certain circumstances, be considered fatigue resistant. When intrinsic fatigue renders a motoneuron unable to continue its activity, other ‘fresh’ motoneurons can be recruited to allow the fatigued motoneuron to recovery. I wasn’t able to see the figures when I opened the blog with Firefox but I can see them with Explorer. If anyone has the same problem, just use explorer.